Maria Ruiz worried about her three sons’ education in Boyle Heights, a low-income Los Angeles neighborhood where she felt the public schools were dangerous and neglected. But when the Partnership for Los Angeles Schools took over leadership of her sons’ low-performing campuses, she witnessed a transformation — in her boys as well as their schools. With the Partnership’s extra training, Ruiz saw how teachers at Roosevelt High School were better equipped to help her autistic son Angel. Mendez High School got a new principal — a successful middle school teacher, Mauro Bautista, who brought an innovative math program now used districtwide. At the two high schools, test scores jumped by more than 60 percentage points in math. Roosevelt Magnet High is now in the top 20 percent of schools for math in the state. Through the Partnership’s Parent Colleges, Ruiz received training in how to help with homework, use computers, and find financial aid. She and her sons received extensive college counseling and help with aid and scholarship applications. And she found the schools safer under the Partnership’s emphasis on restorative justice. 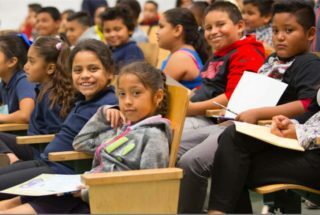 The Partnership for Los Angeles Schools is a unique school model that focuses on turning around the lowest-scoring schools with the highest dropout rates in the toughest neighborhoods of Los Angeles — Boyle Heights, Watts, and South Los Angeles. It runs 18 schools — five high schools, four middle schools, and nine elementary schools — serving 14,500 students. Were it a stand-alone entity, it would be its own mid-sized district in California. A typical Partnership school is 88 percent Latino, 10 percent African-American, 30 percent English learners, 15 percent students with special needs, and 95 percent eligible for free or reduced-price lunch — all higher than district averages. LA Unified invites the Partnership into struggling schools, which then benefit from more freedoms, community resources, and organizational support. Teachers and principals receive intensive professional development, and principals are sometimes replaced and new curriculum introduced. The schools remain part of LA Unified, and they follow state education codes and honor all labor agreements. Instead of expansion, the Partnership’s goal is to share best practices so schools throughout the district can replicate what works. Their contract is renewed every five years with the district. It brings extra resources through connecting its schools with community organizations. For example, City Year works with 10 schools to prevent students who are at high risk of dropping out. Promesa Boyle Heights works with three schools to provide tutoring, counseling, and credit recovery to students who aren’t on track to graduate. 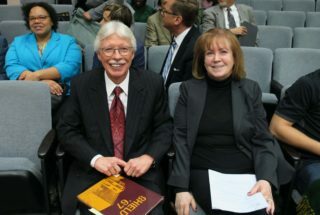 Richard and Melanie Lundquist were honored last week by the LA Unified school board. He is holding her old yearbook from Grant High. If Partnership sees a need at a school, they will try to find a way to help — and not just through education. When 107th Elementary needed a playing field, the Partnership helped it raise about $200,000 from the LA Clippers Foundation and the Yael and Scooter Braun Family Foundation to renovate the school’s field. 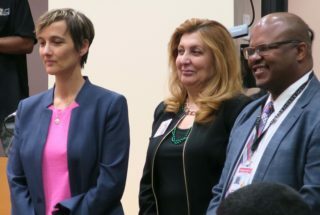 When Florence Griffith Joyner Elementary needed a psychiatric social worker to help students dealing with issues such as homelessness and immigration fears, the Partnership worked with the Wasserman Foundation to add that position. The Partnership model is the brainchild of former Los Angeles Mayor Antonio Villaraigosa, who is now running for governor of California. Partnership’s first CEO, Marshall Tuck, is running for state superintendent of public instruction. The Partnership’s current CEO is Joan Sullivan, whose name is frequently raised as a strong contender for superintendent of LA Unified. In 2006, Villaraigosa tried taking control of the governance of LA Unified but failed after a protracted political and legal battle. He settled on creating the Partnership, which began working with 10 district schools in 2008. But it was in the middle of a severe recession with massive teacher layoffs, particularly in the poorest communities. This year, the Partnership is celebrating a decade of working with schools, and an independent report released last month from Public Impact shows it has achieved tremendous growth with some of the state’s lowest-performing schools. Another educational research organization, the Center on Reinventing Public Education, published a study in October on the partnership model after discovering a sudden proliferation of this type of in-district school turnaround model in 10 cities throughout the country. 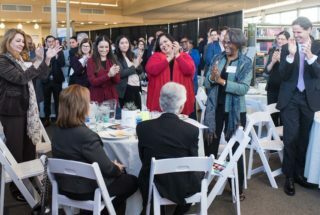 The Lundquists, who both graduated from LA Unified schools, presented their gift last month at the Partnership’s Santee Education Complex, a high school that a decade ago was among the lowest-performing in the state with a 27 percent graduation rate. Today, Santee has an 81 percent graduation rate that tops LA Unified’s. “We searched for two decades to support a program that wouldn’t be just a Band-Aid and create a national model that could be replicated at districts across the country,” said Melanie Lundquist, who was honored with her husband by the school board last week. With the philanthropic money — not counting community partnerships that provide educational and facilities improvements — Partnership schools spend only about $650 more per student per year than the average district student, for whom about $11,000 is budgeted by the state. Some charter schools spend up to $2,000 more per student. Gill stumbled upon the growing number of districts using this governance model in Houston, Philadelphia, Denver, Atlanta, and other districts, which led to the study released last October. He called them “Partnership” schools, after the LA model. Overall, the 18 Partnership schools aren’t outperforming the district as a whole. In math, 20 percent of students in Partnership schools were proficient last school year, compared to 28 percent districtwide. In English, 31 percent of Partnership students were proficient, while 39 percent were in the district. But they are posting faster growth. Partnership overall saw a 5 percentage-point increase in students meeting or exceeding standards in math from 2016 to 2017, and a 7 percentage-point increase in English, according to data from the state. LA Unified saw a 1 percentage-point improvement in math, while the percentage who were proficient in English remained flat. Partnership high schools have increased graduation rates at a faster pace than the district. Their five high schools have seen a graduation rate more than 80 percent on average. Graduation rates at four of the high schools exceeded the district’s in 2016, and all of them have made double-digit gains in statewide percentile rankings since joining the Partnership. Overall, 95 percent of Partnership schools increased their statewide percentile in English language arts, and nearly 90 percent improved in math, Public Impact’s report found. In both English and math, 63 percent of the schools improved their rank by 10 percentile points or more, moving ahead of 1,000 other schools in the state. CCSA compared Partnership schools’ 2017 Smarter Balanced test scores with district and charter schools in the same ZIP codes, ranking them 1-10 in a Similar Students Rank. Partnership high schools beat charter and district schools this past year; Partnership ranked 8, charters ranked 5, and district schools ranked 4. For elementary and middle schools, charters came out on top, ranking 8 while Partnership schools ranked 6; district elementary schools ranked 4, and district middle schools ranked 3. Also, Partnership schools showed growth from 2016 to 2017 in all grade levels, doubling their ranking for elementary and middle schools from 3 to 6 and jumping from 5 to 8 in their high schools, while district and charter schools retained nearly the same rankings. It delighted Sullivan, the CEO, that one of the Partnership’s newest schools, 20th Street Elementary, raised its math scores 19 points, showing the highest math gains of any traditional school in LA Unified this past year. Many of Partnership’s innovations are now used districtwide. It introduced “School Report Cards” that included test scores as well as school experience survey responses by staff, parents, and students. LA Unified adopted the report cards and used them for three years before last year’s rollout of the new statewide accountability measure, the California School Dashboard. The Partnership was an early supporter of unified enrollment, stressing the importance of providing an easy-access website that would give parents one place to apply to all public school options. This year LA Unified started using a modified unified enrollment system, which includes their popular schools of choice — magnets and dual immersion programs — but not independent charter schools. The Partnership’s suggested model for unified enrollment included charter schools. Noticing the low numbers of students identified as gifted at their schools, the Partnership spent $12,000 to test all their second-graders, not just those whose parents requested it, which is the district’s policy. It discovered many more students were shown to be gifted but had never been tested. The district followed the Partnership’s lead and tests all second-graders. In six months, the district saw a 9-point increase in black students identified as gifted. The Partnership is also sharing its success with its Parent College, which trains parents to help their children with homework, prepare them for college, seek financial help, and give basic lifestyle advice. The parent colleges are open to charter parents as well. Joan Sullivan with Interim Superintendent Vivian Ekchian and Local District South Superintendent Chris Downing. The Partnership is also expanding their restorative justice programs — discipline that focuses on reconciliation — into district schools, to seven schools that feed into Partnership schools. Last June, the first 11 principals graduated from UCLA’s Principal Leadership Institute, which was designed for the Partnership. “I have such joy being in partner with these wonderful schools,” said Nancy Parachini, the institute’s director. She served as a principal in Watts and East Los Angeles before developing the program three years ago. Today, all of LA Unified high schools use SpringBoard Math. The Partnership is also studying ways to increase enrollment and attendance. And they are starting to offer dual language programs, starting with one at Sunrise Elementary next year. “We are focusing on how to allocate dollars with equity in mind and share those policy issues with others,” Sullivan said. Tuck said he saw firsthand the success of a Partnership school when visiting 99th Street Elementary on a Dads and Donuts day when fathers read with their children. “It was packed, and it was great to see this kind of participation that Joan and her team inspired by bringing in community partners and additional resources,” he said.